They came professionally dressed, some with bulging portfolios, others with the simple color-coded folders. And they were all looking for one thing: a job to fill as they wait for the partial government shutdown to end. ROCKVILLE, Md. — They came professionally dressed, some with bulging portfolios, others with the simple color-coded folders provided by Montgomery County schools. And they were all looking for one thing: a job to fill as they wait for the partial government shutdown to end. Furloughed workers from the National Archives, the Justice Department and other federal employers sat Tuesday in a packed Montgomery County Public Schools office in Rockville, waiting for their names to be called for such opportunities as substitute classroom teacher, paraeducator and building maintenance staffer. Stacey Kopnitsky, acting assistant director for human resources at Montgomery County Public Schools, said that in just one hour after opening their doors, they had 200 people signed up for interviews and fingerprinting. Tina Junior of Germantown would normally be at her job at the Justice Department but instead was filling out an application, hoping to find work in a classroom. “I’ve been out of work for a few weeks, and my husband also works for the federal government,” she said. “We have two kids — a 5-year-old and a 3-year-old — and as everyone knows, kids are not cheap,” she said, smiling. Among the applicants in the room, there were lots of nervous smiles and conversations regarding the challenges of living without an income as a federal worker. 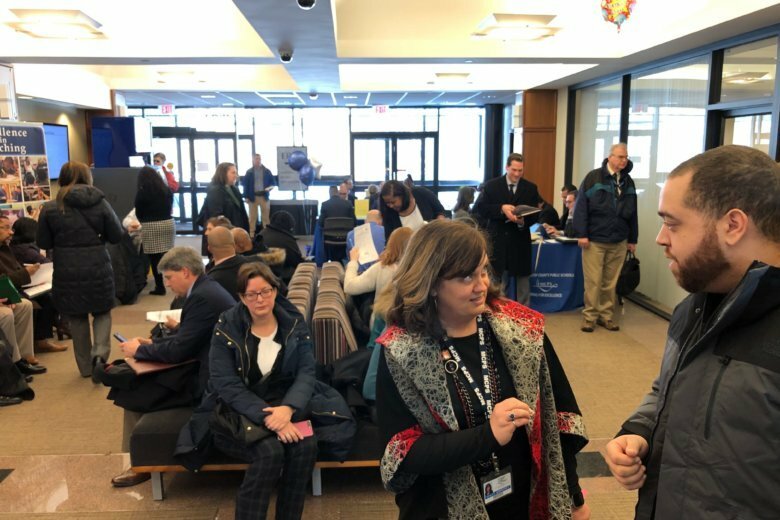 Another job fair will be held Friday from 9 a.m. to 3 p.m. at the Carver Educational Center, 850 Hungerford Drive in Rockville. Learn more on the Montgomery County schools site.